Only 24 Hours to Home? Piercing Monday’s 6 AM darkness, Super Shuttle’s headlights showed up right on time. A quick goodbye to Dad, and I was off . . . well, after two stops for other riders . . . off to Phoenix International and my mega economy-class flights . . . back to Singapore and Mike after two months in the US. In an hour I was standing curbside with three large suitcases plus laptop, purse, and jacket . . . and I had to get inside to check-in at the United counter. Where can I get a luggage cart? Go down to that crosswalk, cross to the island, cross the next road, go into the parking garage. You should see carts for rent in there. Yet in little more than ten minutes of lugging and hauling, I was all checked in and wondering why I had to be at the airport at least two hours in advance for an international flight. The good news was that I could check three pieces of luggage for free. More good news: a United Gold card (and international flights) entitled me to the United lounge for my two hours waiting. Much more pleasant than the gate area, and I knew I’d have no lounge time at SFO where I had a close connection. Luckily, Flight One (Phoenix to San Francisco in two hours) was on time, and the walk from arrival gate to the International Terminal and through security again took only twenty minutes. By early afternoon Monday, I strapped into the center section of a 777 for 11-hours to Narita International in Japan. At this point in Flight Two, I still felt fresh and eager. And this is where I entered the Twilight Zone a few minutes later: You may want to set your watches for local time in Tokyo . . . that would be 5:45 AM Tuesday. Weather there today will be sunny and 25 degrees Celsius. OK . . . tomorrow . . . right now?! An hour after take-off, attendants served a hot lunch (beef or chicken, of course) and, if you were savvy enough to ask, complimentary wine. A disembodied voice said we would have another snack lunch 90 minutes before landing at Narita. I tuned into Tinker Tailor, Soldier, Spy as each seat has individual monitors with on-demand movies, TV, music, games . . . anything to keep the sardines quiet and packed in. By late afternoon (Phoenix Monday), the cabin lights dimmed to dark, and we were all supposed to sleep, I guess. I took Tylenol PM and tried to doze . . . but not really. Most monitors flickered movies in the dark, so I wasn’t the only one with trouble sleeping. Some hours later (3, 6, 9 . . . who could tell in the dark), attendants showed up again with a beverage cart and chips, pretzels, cookie, and a miniature Kit-Kat. Thinking we must be 90 minutes to landing, I tried to rouse myself and eat all those carbs . . . grumbling silently about United’s cheap lunch. Turned on Tinker, Tailor again . . . but then we sank into darkness again. Finally after 2 or 8 more hours (who knows in the Twilight Zone? ), the lights came up bright, and the voice offered a lunch of vegetarian noodles with pot stickers or a turkey sub sandwich before landing at Narita in another 90 minutes. By the time we landed in Tokyo, I had lost all sense of day or night, right or wrong. All I knew was Flight Three was some hours away, it was Air Japan (ANA), and I didn’t have a boarding pass. Standing in the middle of an intersection, I tried to get my bearings and read Japanese. 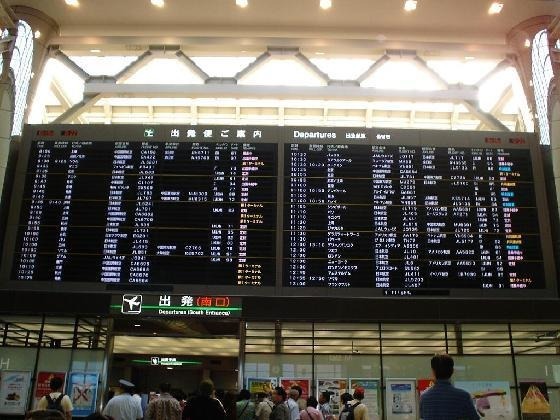 Narita’s departure board flashed continually, alternately languages—Japanese, English, Mandarin, other mystery langugues—pausing only a few seconds on each. After staring at it for many minutes, I gave up and headed for United Connections where people were getting boarding passes right and left. Polite Japanese Girl: Ah yes, your flight has a UA codeshare number. But I cannot give you a boarding pass. Please get your seat assignment from ANA. (Studying her screen) Your flight will leave from Gate 58 at 17:45. But (looking at watch) they won’t be there yet. Me: I think I have a seat assignment; I just need a boarding pass. Does ANA have a connection counter? Polite Japanese Girl: Ah, yes. 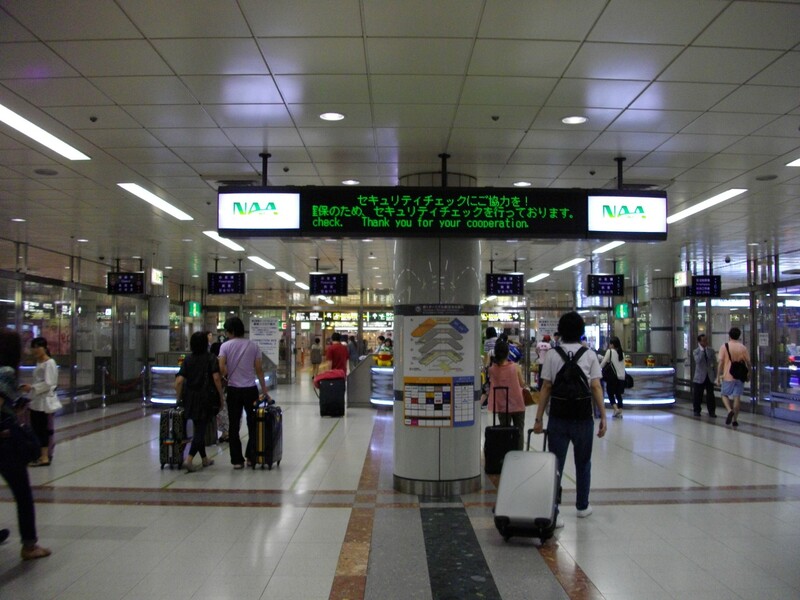 Go toward Gate 50 (pointing down one of the hallways), and you will see ANA connection counter. We concluded with some head bowing back and forth. In a slight haze, I passed bright lights, glitzy duty-free shops, people wearing white face masks. Signs featured Japanese characters, and some had smaller English beneath. No signs read To ANA→ and no arrows pointed to “ANA Connection Counter,” but I had faith. Sure enough, soon another smiling, bowing Japanese girl took my passport and paperwork, and I was in business! Me: Do I have a good seat? Smiling ANA agent: Ah, let me look. Row 18 G. The airplane has 2 seats and 3 seats and 2 seats (shows me with her fingers). That is a window seat. Me: Yes, thank you. That is a good seat! Smiling ANA agent: Ah, yes please. You are invited to ANA lounge. (The invitation actually appeared on my boarding pass!) Up this escalator, please. More head bowing. Snacks in the ANA lounge were decidedly Japanese, and I had time for Miso soup, rice cake, and a glass of white wine . . . thankfully, universal. The lounge toilet had electronic controls alongside a gently heated seat, and surprising water sprayers somewhere that gets your attention! Boarding started at 17: 10, so I kept close check on my watch, finger counting to keep track of when to set off for the gate. Man: I don’t have one of those, but I fill out form just in case. Me: But you have an EP—Employment Pass—right? Man: Yes, I have EP, but I want one of those (pointing to my DP pass with a laugh)—someone to come home to. Me: You’re probably just working too much. Do you want me to fix you up with someone? Later, as we exited the ANA gate to a line of bowing flight crew, it dawned on me. Sure I had my own DP in hand, but I also had a living EP holder waiting at home for me. Lugging three heavy suitcases and laptop around didn’t matter. Twenty-four hours cramped in the uncertain twilight zone of airports and airplanes didn’t matter. All unpleasantness vanished after midnight when I saw Mike waving to me through a glass wall at Changi International in Singapore. I was home . . . so eager to see him . . . and his treasures from Chiang Mai. Ohhhh… that left me smiling!! And I was very happy to have her home again! . . . . “anything to keep the sardines quiet and packed in.” That is funny. I love you account of your return trip to Singapore. You did very well. Bet you were glad to see Mike. What an adventure you are having.